Bracketology is the process of predicting the field of college basketball participants in the NCAA Basketball Tournament. Ribology is the process of devouring lusciously grilled ribs while the games unfold. It’s time for Grill Madness – three weeks of fun with the grill, friends, and competition to see who wins the big dance. To start it off, we are going big with Grilled Jalapeno Ribs, an addictively finger licking good combination of sweet and spicy madness. We begin with a rub of brown sugar, chili powder, salt, pepper, and garlic powder generously patted and rubbed into the meat. The sauce is a reduction of tomato sauce, brown sugar, lemon juice, and chopped jalapenos with a level of heat causing the eater to crave both refreshment and further tasting after each mouthful. The madness will come… It cannot be abated… So fire up the grill, fill out your brackets, embrace the madness, and grab plenty of napkins. In a small bowl, combine the first six ingredients; rub onto both sides of ribs. Note: It is not necessary to apply the dry rub hours beforehand; applying just before cooking yields the same results. 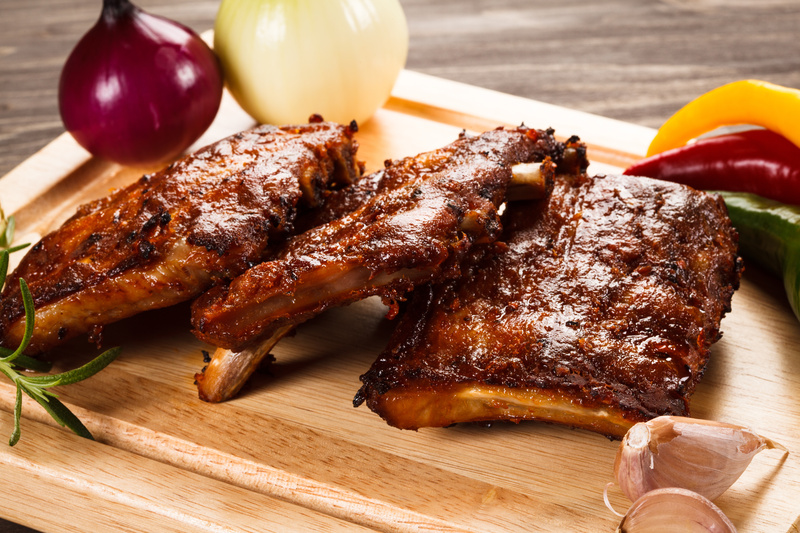 Prepare the grill: Place a drip pan filled with water in the barbecue – the ribs will cook above it. If using a gas grill, place the pan to one side and only light half of the burners. If using charcoal, get the coals hot and spread them out from the middle, creating a well for the drip pan to sit in. Check grill to see if it’s reached the proper temperature, 200 degrees F. Place ribs on grill over drip pan, close barbecue lid and cook for about 1 1/2-2 hours at 200 degrees F. Turn ribs every 20-30 minutes, adding coals or adjusting gas to maintain a steady 200 degrees F. Some fluctuation is okay (and unavoidable if using charcoal), but the goal is to stay between 190 degrees F-220 degrees F.
Meanwhile, in a large saucepan, combine sauce ingredients; simmer, uncovered, for 30-40 minutes or until thickened. Begin basting ribs with sauce in the final 10 minutes of grill time (after about 1 1/2 hours). Any earlier and the sauce will simply dry out. Note: The USDA states that pork should be cooked to an internal temperature of 160 degrees F. It is difficult for the meat to retain its juices at this temperature (145 degrees F will produce deliciously moist and juicy ribs) but if you are concerned about safety, follow the USDA guidelines and be aware that the ribs will be on the dry side. Once the ribs are cooked, wrap them tightly in aluminum foil and place inside paper bags. Set aside for 30 minutes to allow them to steam and tenderize the meat further without overcooking.